When you’re selling your home, you want to make it as appealing and enticing as possible, and it starts with the most basic principle: color. That is, the color of your walls. Over the years you may have adapted a certain color scheme, but unfortunately not everyone is going to enjoy the same look as you, especially if you’re into deep and bold colors. Your home isn’t your “home” anymore; it’s now a product to sell. A home buyer isn’t just thinking about the price of the home but also the work and money they have to put into renovations after purchasing. If they are immediately turned off from the color of the walls, they will most likely be less interested in the home. So take some time to stage your home a little bit. Yes, it may cost some money but in the long run it’ll make your home look more appealing and, more importantly, easier and quicker to sell. 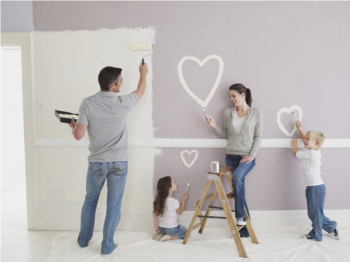 Most real estate professionals will encourage sellers to paint their walls neutral colors. Surprisingly, this doesn’t mean white, but warmer colors such as pale yellows, beiges, light browns, greys and softer blues. Colors that don’t necessarily immediately stand out, but rather make someone feel more comfortable and calm. Especially for smaller rooms, these neutral colors can make the room appear larger. As well, neutral colors allow the potential home buyer to easily visualize their things in the new space and how they want to shape it. With the Internet becoming more relevant and useful in the real estate market, your home will look more appealing online if it has neutral colors for walls. Living room: The living room, without a doubt, is one of the most important rooms in a home. Families go there to relax and spend time, and the home buyer will definitely be scoping it out, sitting in it and getting a feel for it. The wrong color may set off the visitor and may create an uneasy environment – even if it’s comfortable to you. However, a slightly bolder color such as a light brown, can work well in a living room to make it feel warmer and affable. Kitchen: Like the living room, the kitchen is one of the most important rooms in the home. A kitchen can make it or break it for potential buyers, so a solid impression is important. Bright yet neutral colors are recommended because of the amount of time spend in the kitchen. Don’t you want to see where you are cooking your food? Bedrooms: While the bedrooms will be shown to potential home buyers, they won’t be as important as the living room and kitchen. Though, switching the color of the rooms to milder tones may not be a bad idea, especially if the room is smaller. More importance should be put on the master bedroom to appeal to couples. Bathrooms: Unless you own a mansion, your bathrooms are going to be small. Like the kitchen, bathrooms – in particular the main bathroom for the master bedroom – can be a deal breaker. Lighter neutral colors will make the bathrooms appear larger, but try not to make them too light or they will appear dull. Selling your home can be stressful, but if you want to increase its chances in the market, put some work into it adn ask your real estate agent. Maybe spend a weekend or a day or two off work, and maybe ask friends and family for some help. Now, pull out those rollers and brushes!